PLAY at Movies; Cheering the Good Guys and Hissing the Baddies! There really is nothing like a night at the movies, is there? A good weepy or a thriller is somehow good for the spirit. Glasgow has no shortage of classy acts, when it comes to the movies. Whether you want to try out Scotland's only IMAX cimena, lounge on a leather sofa while watching your movie, take a visit to the tallest movie house complex in the world, or take part in an International film festival, then Glasgow is the place for you. Scotland has given the world Sean Connery, Ewan McGregor and the best Doctor Who in David Tennant, so our place in cinema is well deserved indeed! 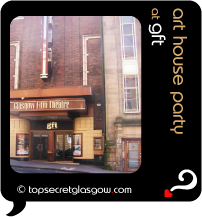 Glasgow Film Theatre brings movie culture to Glasgow: classics, contemporary British and foreign independent films and film festivals for all. Great news! Finding this page means you can now join our VIP list for PLAY at Movies. Time to grab your very own page for PLAY at Movies. Do you have a special story about a time you decided to PLAY at Movies? A funny experience? A grand occasion? A funky photo? A personal tip? A top secret?